London will be a hive of activity this weekend, with the huge anti-war demo in Trafalgar Square on Saturday, followed by a march to Downing Street, and the UK Uncut occupation of Westminster Bridge on Sunday, in protest at the government’s attempts to privatise the NHS. There’ll be a heap of big names in Trafalgar Square, including Wikileaks founder Julian Assange, who will be giving a speech. Musicians Billy Bragg and Brian Eno and campaigners Jemima Khan and Peter Tatchell will also be there, as will numerous MPs, actors and musicians – and families of military personnel. The event will mark the 10th anniversary of the invasion of Afghanistan – and be part of building political pressure on our government to withdraw from that country and from the other wars it has helped to start. It’s a sad fact that the Afghanistan conflict has seen 10 years of the richest countries in the world fighting what is possibly the single poorest in the world – yet they still haven’t won. The mammoth waste of money that has been spent on this pointless conflict has led to huge cuts in public services here in the UK as the government struggles to balance the books. As billions of pounds continue to drain out of this country’s coffers to pay for the fighting in Afghanistan and Libya, and the continuing occupation of Iraq, the cuts here can only get more savage. Meanwhile, the myth that ordinary Americans are bovinely supportive of their government in the matter of its wars is being rapidly dismantled. There is a large and active anti-war movement in the US and protests about the Afghanistan war will be taking place across the US on Saturday. Meanwhile, the Occupy movement, which has seen recent major occupations of New York, Chicago and numerous other cities in protest at corporate greed, is growing by the day – yet it has received little mainstream media coverage. More on the American movement in a later post. Here in London, the Trafalgar Square assembly starts at noon and ends about 4pm, when the protesters will march to Downing Street, led by ex-soldiers and relatives from military families, with the demand that the government bring the troops home now. More than 2,500 people have pledged to attend, making the event “possibly the largest single act of civil disobedience in the UK for years”, according to UK Uncut. It argues that the cuts to public services are unnecessary – either the tax avoided and evaded in a single year or the taxpayer subsidy to the banking industry could pay for all of the £81bn, four-year cuts programme. The organisation also points out that the £7 billion due to be paid out in bank bonuses this year is more than the first wave of public spending cuts. 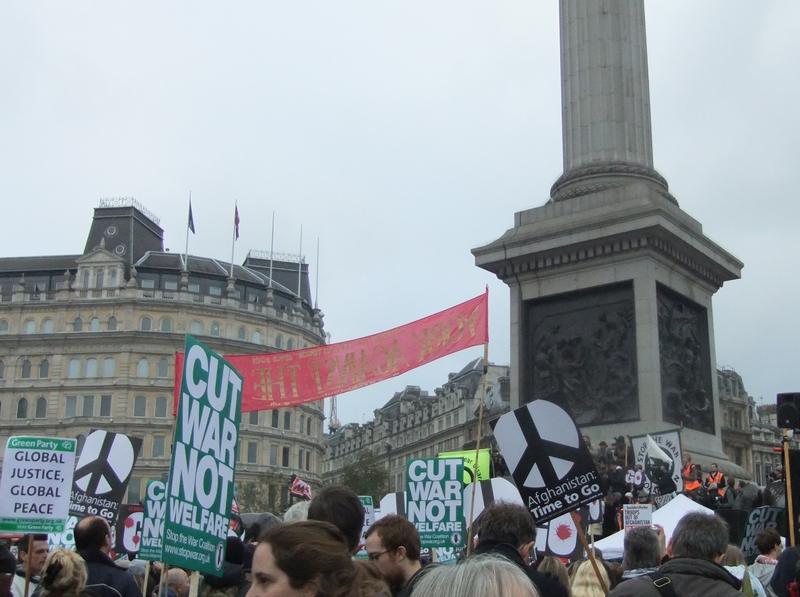 Unlike the organisers of the Trafalgar Square assembly, UK Uncut doesn’t make a direct connection between the cuts and expenditure on war, but doubtless there will be many who attend both events. I’ll probably have to miss both as I’ll be among more than 1,000 journalists, film-makers, publishers and activists attending the Rebellious Media Conference, being held throughout the weekend to challenge the deference of the mainstream media to corporate interests and government lies, and to develop alternatives that have real integrity. More on that here next week.